Plants aquatic, sometimes stranded, annual. Stems decum- bent, later ± erect if stranded, reddish in age, usually branched at base, to 14 cm, (rooting at basal nodes). Leaf blades oblanceolate to linear, 2-6 mm, apex acute. Inflorescences lax; flowers 1 per node. Pedicels 0.5-20 mm. Flowers 4-merous; sepals ovate to oblong, 0.5-1.5 mm, apex obtuse to rounded; petals ovate to oblong, 1-2 mm. Follicles erect, 6-17-seeded, oblong; old follicles spreading, flat. Seeds oblong-ellipsoid, (0.3-)0.4-0.5(-0.6) × 0.1-0.3 mm, not papillate, dull, minutely rugulose. 2n = 42 (Iceland). Flowering late spring-summer. Coastal marshes and brackish mudflats, vernal pools, muddy margins of ponds and streams; 0-3000 m; St. Pierre and Miquelon; B.C., N.B., Nfld. and Labr. (Nfld. ), N.W.T., N.S., Ont., P.E.I., Que., Yukon; Ala., Alaska, Ariz., Calif., Colo., Conn., Del., Ga., Idaho, La., Maine, Md., Mass., Minn., Mont., Nev., N.H., N.J., N.Mex., N.Y., Okla., Oreg., Pa., Tex., Utah, Vt., Wash., Wyo. ; Mexico; n Eurasia. 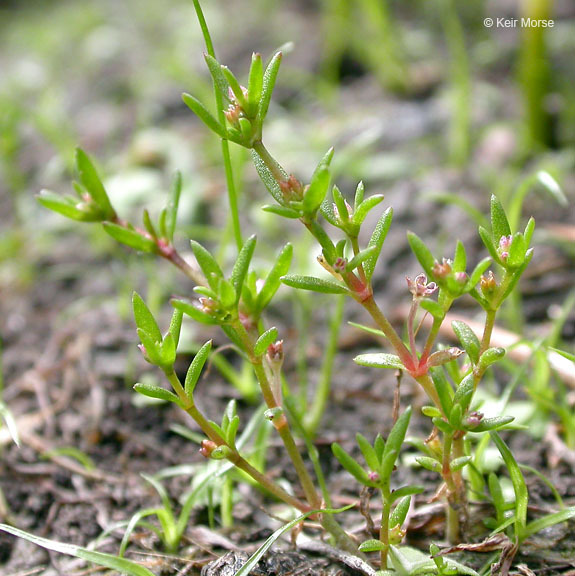 The typical form of Crassula aquatica, with very short fruiting pedicels, grows chiefly in coastal salt marsh. It is rare and widely scattered in Alaska and Canada (W. J. Cody 1954), scarcely more common southward. M. Bywater and G. E. Wickens (1984) separated C. saginoides by pedicels elongate in fruit, sometimes to ca. 2 cm. It grows mostly inland and sometimes to 3000 meters, but from the specimens that they annotated, the ranges are not distinct. N. L. Britton and J. N. Rose (1905) and W. L. Jepson (1923-1925) have separated it, at least varietally, under other names, but most authors have included it without comment or at most have called it doubtfully distinct. I call it merely a phase of C. aquatica not needing a formal name (R. V. Moran 1992b). A typical strand plant is depicted in the lower left corner of the illustration panel on this page. PLANT: Erect to decumbent herb, to 15 cm long. LEAVES: elliptic-oblanceolate, acute, 2-6 mm long, 0.5-1.5 mm wide. FLOWERS: 1 per node, 1.2-2 mm long, on pedicels in age 2-19 mm; sepals deltoid-ovate to oblong, subacute to rounded, 0.4-1.3 mm long; petals lanceolate, subacute, 1.0-1.9 mm long. FOLLICLES: 6-17-seeded, erect before opening, oblong, subtruncate, the suture straight below, abruptly outcurved through 90 0 in upper one fourth, the tiny style spreading. SEEDS: elliptic-oblong, not papillate. NOTES: Infrequent, ponds and wet meadows; Apache Co.; 2900 m (9500 ft); Aug-Sep; to AK, Can., Mex., n Eurasia. C. saginoides is an inland phase with pedicels elongate in fruit. REFERENCES: Moran, Reid. 1994. Bixaceae. J. Ariz. - Nev. Acad. Sci. Volume 27, 190-194.